But above all be convinced of Jesus’ tender love for you in and through this present situation and no matter what its outcome is, listen to Jesus speak in your heart. Agnes Gonxha Bojaxhiu, was born on August 26th, 1910 in what is now called Skopje, the capital of present day Macedonia. She was the youngest child of an Albanian family whose father died when she was eight years old. After his death, Agnes’ mother raised her as a Roman Catholic. In her youth, Agnes was fascinated by stories of the lives of missionaries, and by the age of twelve she knew she was called to the religious life. She left home at the age of eighteen to join the Sisters of Loreto as a missionary and never saw her mother or sister again. 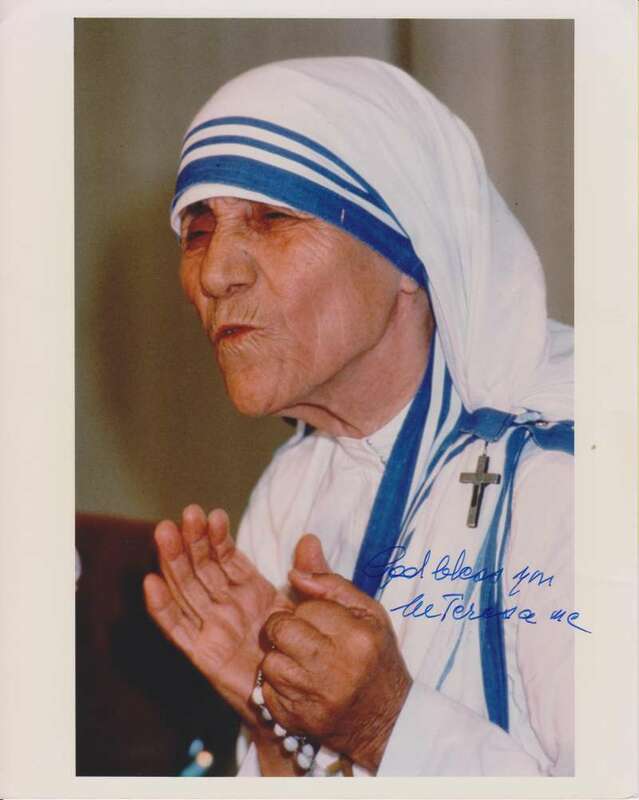 She made solemn vows on May 14th, 1937, taking the name of Teresa. Her work in India was preceded by the need to learn both English and Bengali so that she might serve the needs of the people of Calcutta. 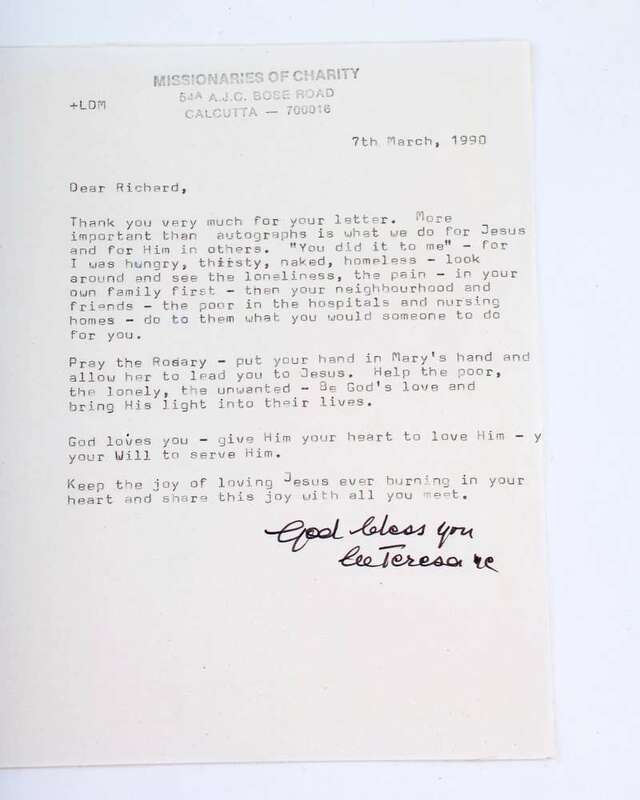 In 1946, Teresa experienced the call within the call when she felt compelled to leave the relative safety of the convent and help the poorest of the poor while living among them. She understood this to be an order.To fail would have been to break the faith. From that point, Teresa began to attract the attention of the Indian officials, including the Prime Minister, who expressed his appreciation of her. Eventually she became known world wide for the work she was doing in India and for the impression she was making in wealthier countries as well. In 1952 Mother Teresa opened the first Home for the Dying where people received medical attention and the opportunity to die with dignity according to the rituals of their faith. Muslims were read the Quran, Hindus received water from the Ganges, and Catholics received the Last Rites. A beautiful death is for people who lived like animals to die like angels, loved and wanted, she said. 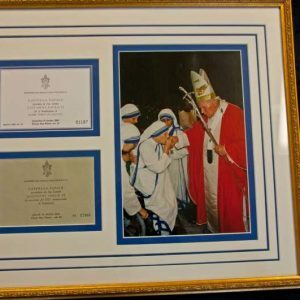 The Papal Artifacts Collection has two letters written by Mother Teresa to Father Richard Kunst. One chides him for asking for her autograph but she still signs the letter. 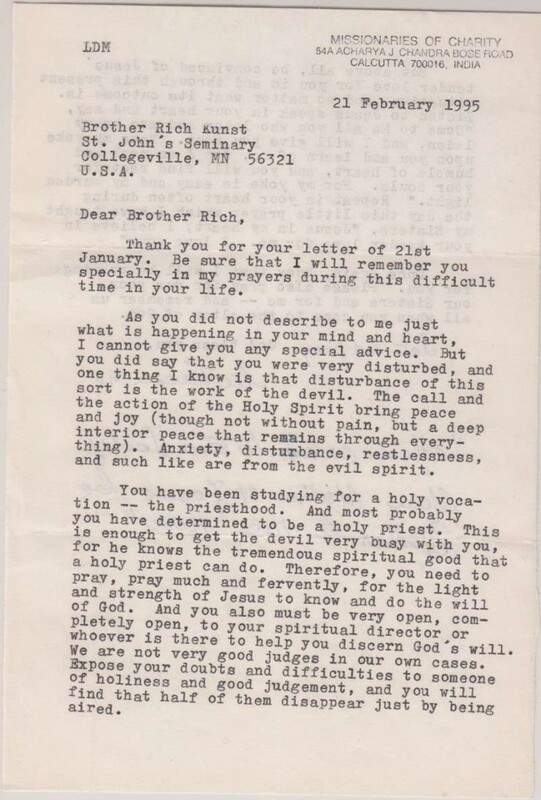 The other is in answer to a request for prayers during a time of discernment regarding his vocation. She offers both her promise of prayers and her advice. 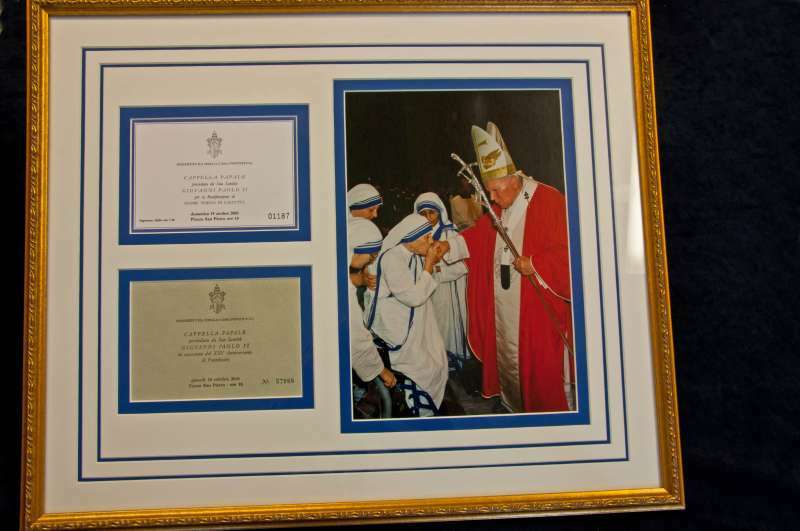 There is also a signed photograph of her and an additional letter donated to Papal Artifacts. 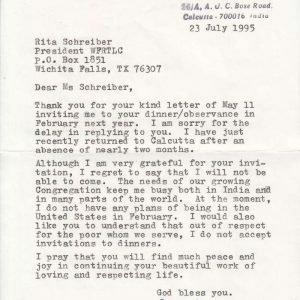 A third letter, featured below, to Miss Rita Schreiber was donated to the Collection and also contains the signature of Mother Teresa. But above all be convinced of Jesus’ tender love for you in and through this present situation and no matter what its outcome is, listen to Jesus speak in your heart. 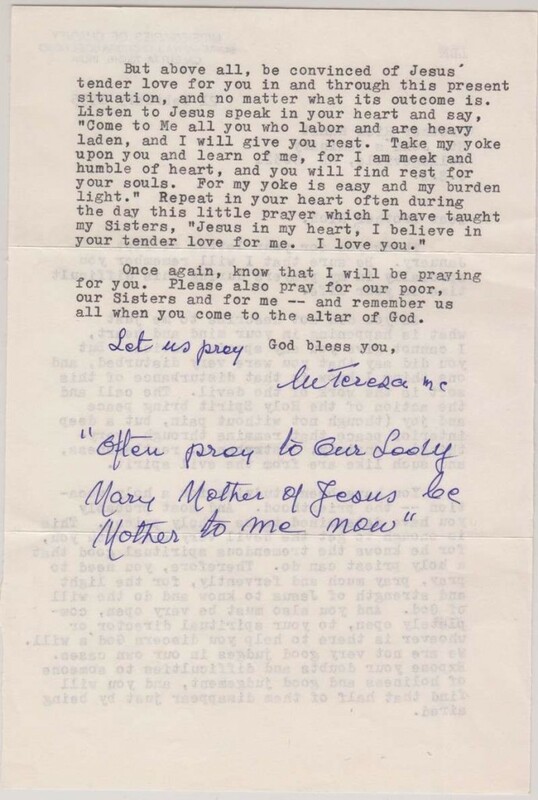 — Words of Mother Teresa address to Richard Kunst. She told us, Elizabeth Mauro says, that love begins where the self leaves off. You must first forget yourself, so that you can dedicate yourself to God and your neighbor. (While that sounds simple) Mother Teresa was perfectly serious in her challenge, and that far from being a trite, easily shrugged off idea, what she was preaching was something quite radical. In fact, particularly in our age of boundless self-involvement and exhortations to self-love, Mother Teresa proposes an idea of true revolution, the revolution of completely abandoning the concerns of self so as to look only at Jesus and at the people who share our world. 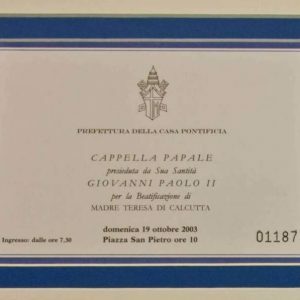 It is striking to consider that both Mother Teresa and her contemporary, Pope John Paul II (1978 –2005) came from war-torn Eastern European countries in which human life was held cheap, where invasion was common, and self preservation was a daily mission. Given such backgrounds, one might expect them to abhor any raiding of their personal lives, to hold the world at arms length. And indeed, for a short time, Teresa was secure behind the high walls of the private school where she taught, just as John Paul was comfortable in his bishop’s lodgings. But urged on by Christ, both cast off the safety nets and sequestered surroundings to stride boldly into the world in utter surrender. They willingly rejected self-interest and allowed their personal spaces and lives to be plundered again and again. 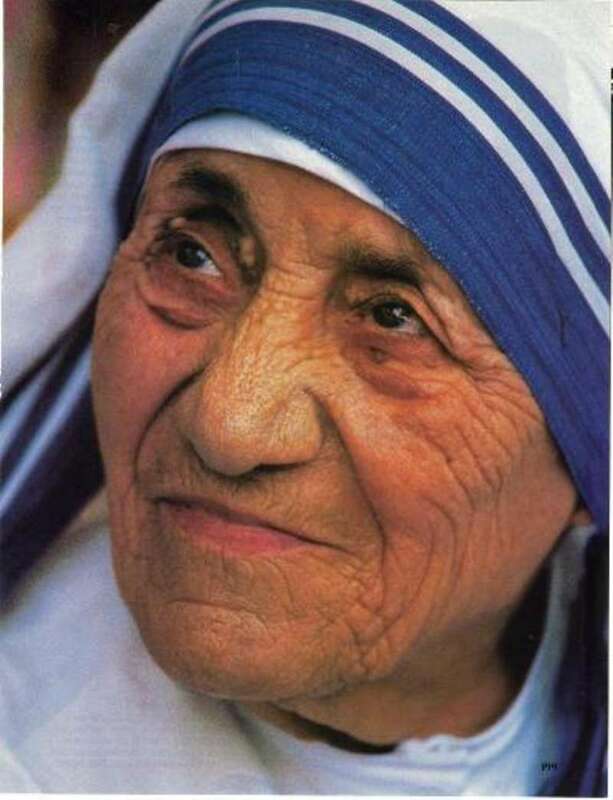 From the filthy gutters in which she found and ministered to the poorest of the poor, Mother Teresa looked up at the relentlessly materialistic world and pointed out how spiritually impoverished and needy it was. She recognized, as perhaps only a survivor of invasion and oppression could, that good and evil could often look remarkably alike, and that the best way to differentiate between them was to look beyond oneself, surrendering all in service of others. Lord, my God, who am I that You should forsake me? The child of Your love, and now become as the most hated one. The one You have thrown away as unwanted, unloved. I call, I cling, I want, and there is no one to answer. Where I try to raise my thoughts to heaven, there is such convicting emptiness that those very thoughts return like sharp knives and hurt my very soul. Love, the word, it brings nothing. And yet, even when feeling profoundly abandoned, Teresa never deviated from the mission she felt called to carry out. In her words to a priest, himself undergoing a dark night, one sees how she was able to move beyond the pain of her emptiness. Once again, the solution is rooted in self-abnegation. In you today,Jesus wants to relive His complete submission to His Father, she wrote to that priest. It does not matter what you feel, but what He feels in you. You and I must let Him live in us and through us in the world. Mauro ends her review of this biography stating that this is the most revolutionary idea of our time. Mother Teresa died on September 5th, 1997. 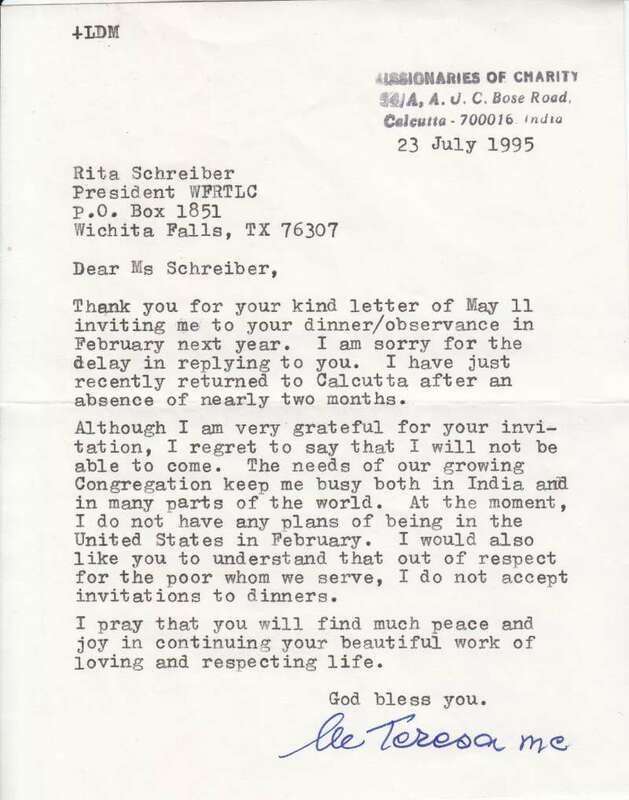 There were 4,000 Missionaries of Charity at the time of her death and by the 1990’s over one million co-workers aiding in the ministry she began. 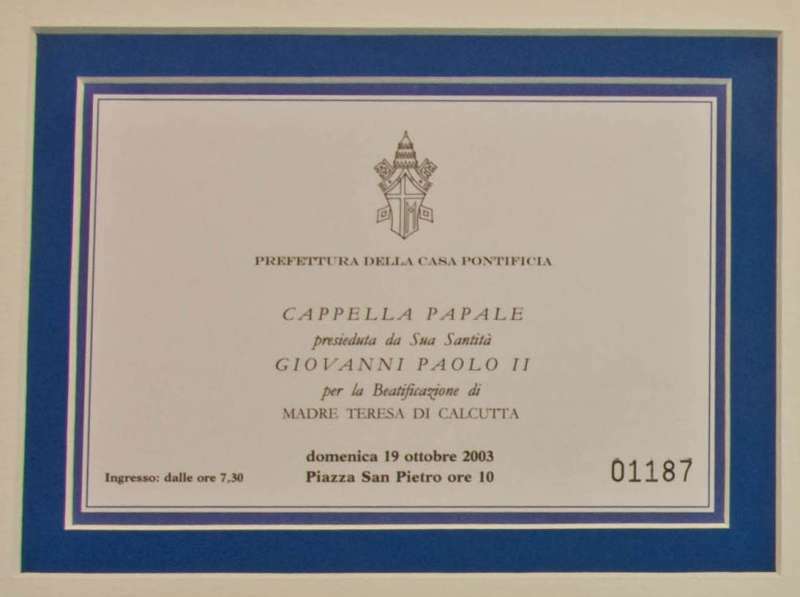 Blessed Pope John Paul II beatified Mother Teresa on October 19th, 2003 and canonized her on September 4, 2016, by Pope Francis. Her feast day is celebrated on September 5th.